Meaning of course that the quality of the camera is not the rate-limiting step in taking great photographs. The camera is just a tool. I’m not a famous photographer. I’ve not even achieved the status of a totally-unknown photographer. But I do like taking photographs. About 99% of the images used on this site are mine, and I probably take a few thousand photographs a year (keeping several hundred and printing a handful 1). I particularly enjoy landscape photography, but a large proportion of my photographs are of bees, beehives, apiaries and beekeeping. These are used in talks, here and elsewhere online and as an aide memoir to compensate for my patchy note taking and even patchier memory. If you give beekeeping talks they really have to be illustrated. There’s nothing much worse (root canal treatment?) than sitting through an hour of Powerpoint slides containing nothing but text 2. But most readers of this site probably give few talks and write fewer articles. That doesn’t mean a camera can’t come in useful. My note taking – despite my best efforts – is often less than ideal. A quick snap of the apiary as I leave indicates which hive is where 3. It shows more or less how each hive is setup. 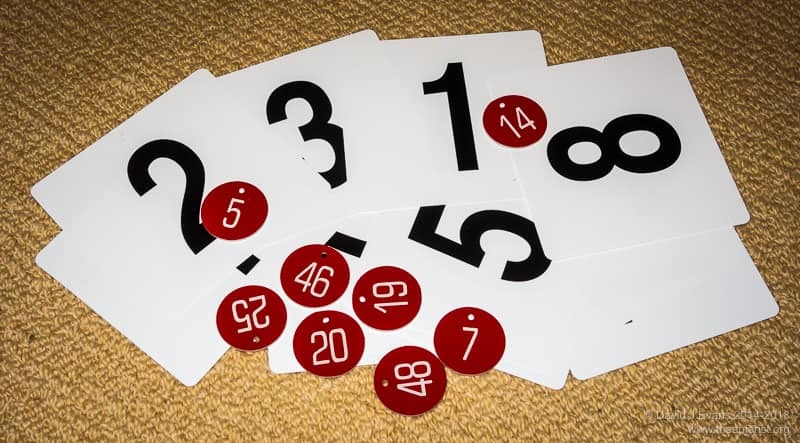 Numbers of supers, type of split etc. If the hive numbering is also visible (more on that shortly) it can provide a useful memory boost when completing the notes … or a sanity check that the notes recorded actually relate to the hive in question. Photographs are particularly useful when identifying diseases and pathogens. A good quality image of a questionable frame makes subsequent diagnosis much easier than relying on your memory. 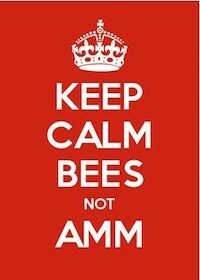 It might also be useful for the bee inspectors or the association’s disease maestro. Martyn Hocking used a photograph to support his find of an Asian Hornet in Devon last year. A reasonable quality photo sent to alertnonnative@ceh.ac.uk would undoubtedly help prioritise efforts to repel this new and unwelcome invader. I rarely go anywhere without a camera. Sometimes it’s only my ageing phone, but even that’s got a reasonable camera. Newer smartphones have much better cameras with good video capabilities. However, although the tale of the photographer and the writer has a lot of truth in it, there are certain circumstances when the limitations of the camera are rate-limiting 4. For photographing bees or detail (e.g suspected disease) in the hive the usual limitations are accurately focusing on small objects close up and the amount of light that reaches the sensor. For these reasons I usually have a compact camera in the bee bag. 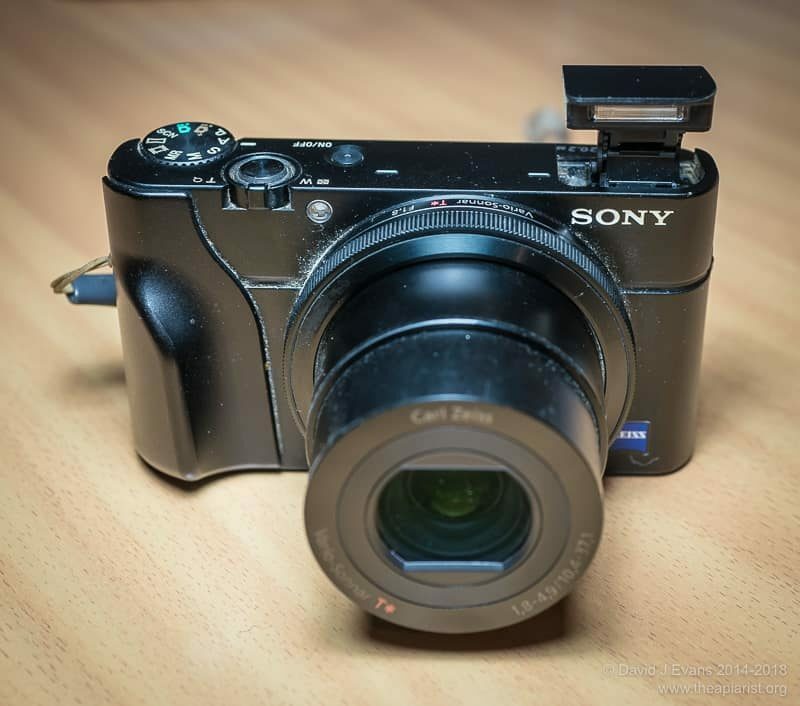 For years I’ve been using a Sony RX100 5 which has a fast (i.e. wide aperture) short zoom Zeiss lens. This is an amazingly competent camera. It’s little bigger than a pack of playing cards, but the combination of a 20 megapixel sensor (5472 x 3648 pixels) and the exceptional lens generates outstanding quality images 6. Used in one of the automatic modes the camera generally produces reasonably well-focused and exposed images, automagically increasing the ‘film speed’ (ISO) if the lighting is poor. Unfortunately, a year or so ago I dropped the Sony onto a tiled floor and it’s never been quite the same since. The lens cover doesn’t always open or close and it has developed some unpredictable electronic hiccups. Although it’s still my ‘go to’ day-to-day camera these problems prompted me to look at an alternative. This is another 20 megapixel quality compact camera. It has four features that are really useful for the photography of bees and beekeeping. It has a fold-out LCD screen that helps compose the image at waist level. The LCD is also a touchscreen so you can simply tap it to select the focus point and take the image. It has excellent video capabilities, including 4k and slo-mo (high speed, 120 frames/second – e.g. these scout bees inspecting a bait hive entrance). Finally, it has a feature called ‘post focus’ which allows you to take a photograph and choose the point of focus after recording the shot – more on this later. 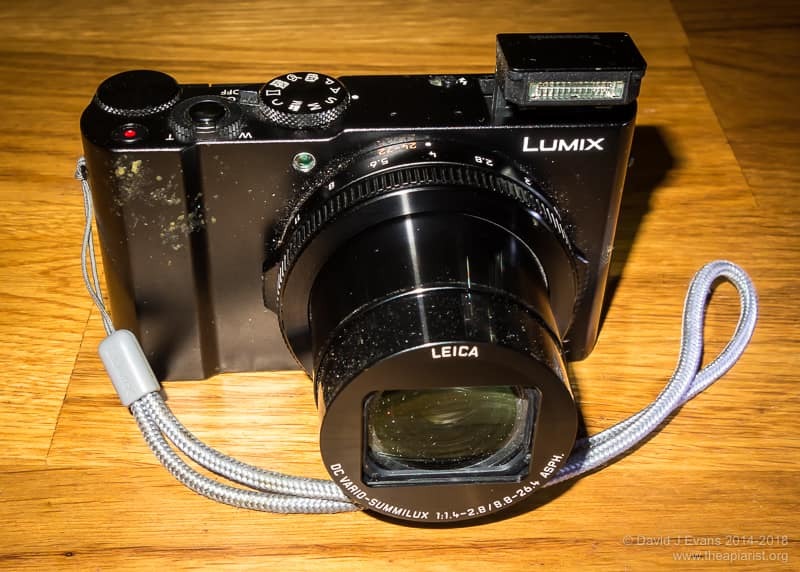 However, although the LX15 is a very competent camera, the quality of the lens is not as good as the Sony 7. Although this isn’t usually an issue for images that will be displayed at a small size or online, it’s rather obvious when viewed enlarged or printed. If you go to the trouble of taking a camera with you and find yourself in front of a stunning sunset or a breathtaking panorama (or mother and daughter queens on the same frame or an Asian hornet), you want to have confidence that the quality of the lens is good enough to record the scene. Smartphones and most point and shoot cameras record the image in JPEG format. The image has an automatic amount of contrast enhancement, colour enrichment and sharpening applied by the camera. 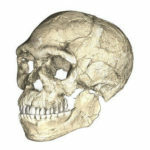 These changes to the image are irreversible and they usually result in a reasonable satisfactory picture 8. However, for real flexibility the two cameras above (and many other reasonable quality cameras) have the option to record the image in RAW format i.e. the native data from the sensor. These can subsequently be processed (often quite quickly) on a computer to create the desired final image. This post-processing allows local and global changes in exposure, cropping, colour, sharpness and contrast. All of my RAW images are post-processed with Adobe Lightroom. Those used online take no more than a minute to manipulate, while those destined for printing and framing get a lot more attention. The one thing you cannot correct during post-processing is focus. If the subject of a picture is out of focus you’re scuppered 9. Taking close up handheld photographs of a moving subject, like a queen on a frame of bees, is not easy. This is due to a combination of the available lighting, the shallow depth of field and the movement of the subject. Because the bees are moving you need a reasonably fast shutter speed to freeze them. A fast shutter speed – unless the lighting is exceptionally bright – means that the aperture 10 must be set to maximise the light getting to the sensor. You’ll often hear photographers talk about wide aperture, or using the lens ‘wide open’. And this is where the problems really start. Due to the laws of physics, the wider the aperture, the smaller the depth of field. The depth of field refers to the vertical slice of the image that is in focus. Anything in front or behind this will be out of focus. Not only does depth of field depend upon the aperture, but it is also influenced by the distance between the lens and the subject. The closer the subject, the shallower the depth of field. As an example, using a camera 11 focused on a subject 10 metres away the depth of field is 5.79 m (from ~7.8 to ~13.6 m). Everything between these distances will be in focus. At 1 metre the depth of field is 11 cm (from 0.95 to 1.06 m). At 30 cm the depth of field is 4mm (from ~29.8 to ~ 30.2 cm). At anything less than 15 cm the depth of field is 1 mm or less. Can you hold a camera steady enough to keep the subject within the 1 mm depth of field you have? What about if you are holding the frame with one hand and the camera with the other? Probably the greatest recent advances in compact digital cameras have been in their video capabilities. The Panasonic LX15 takes advantage of these to allow you to record the scene and decide afterwards which part of the final image you want to be in focus. It achieves this by analysing the scene and determining the closest and the most distant objects in the field of view. When you press the shutter it then takes a 1-2 second 4k (3840 x 2160 pixels) resolution video, changing the point of focus throughout. This short video shows how this looks (the camera was handheld). You can then, in camera or during post-processing, scroll through the video and choose precisely the frame that has the desired subject in focus. The three images below are all from the video above. The originals are cropped to ~4 megapixels, but reduced further in size and quality to present here. This is pretty remarkable technology. It’s worth remembering that, for any individual captured frame, the depth of field is still determined by the aperture the lens is set at. The images above are all at f1.6 (i.e. just about wide open). You can even combine frames from the video with different planes of focus to make a composite image with a deeper overall depth of focus, just covering the area of the image you are interested in. This focus stacking feature, unsurprisingly, doesn’t work well with a moving subject like bees on a frame. Similarly, you either need a very steady hand or (better) a tripod. I’ve only used this feature a few times and don’t see a routine application for it. I’d prefer to modify the depth of field by changing the aperture to achieve the same end result. Post-focus sounds like the perfect solution to solve the problems with close up photography. The two biggest limitations are the size and format of the final images. These are in JPEG format and ‘only’ 3840 x 2160 pixels (8 megapixels, rather than the 20 megapixels that the camera is capable of with still pictures). These significantly reduce the options for subsequent enlargement and negate most options for post-processing. 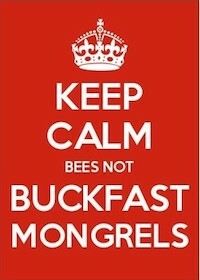 However, for online use (or emailing to the regional bee inspector) they are more than adequate. The combination of changing the plane of focus during the short video and the movement of a handheld camera can mean that the desired subject is only fleetingly – if ever – in focus. I suspect that post-focus will become commonplace on cameras (and smartphones). It’s got a lot to offer, but isn’t yet a perfect solution. Both the cameras mentioned cope well with a periodic liberal coating of propolis. You can scrape it off the camera body easily, but it’s worth trying to keep it off the rear LCD panel. In particular, try to keep the touchscreen LCD of the LX15 propolis-free. 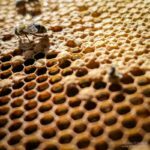 If you want to see some better quality beekeeping photography have a look at the images by Simon Croson or the wonderful pictures by Eric Tourneret in Cueillers de Miel. Saying “cheese” makes your mouth adopt a shape roughly approximating a smile. It is therefore an instruction given by photographers to help create more appealing images. It’s not essential. 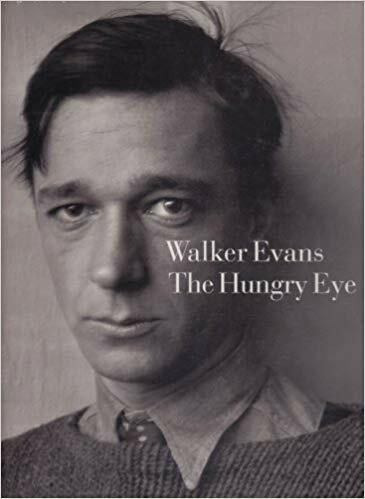 Walker Evans, a great photographer famous for his work for the Farm Security Administration during the 1930’s didn’t ask his subjects to say “cheese”. His portraits and photojournalism are outstanding. In languages other than English different instructions are sometimes given e.g. most Latin American countries use Diga whiskey (say “whiskey”), Sweden Säg omelett (say “omelette”) and Bulgaria Zele (“Cabbage”). Lots of countries use a variant of Watch the birdy or Smile at the little bird. The idiom A picture is worth a thousand words dates back over 100 years to a newspaper article in 1911 about journalism and publicity where the phrase “Use a picture. It’s worth a thousand words” was used. Even earlier, Napoleon (1769-1821) is reported to have said “Un bon croquis vaut mieux qu’un long discours” (A good sketch is better than a long speech). 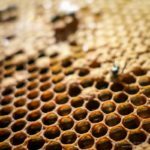 This entry was posted in Beekeeping, Photography, Records on November 23, 2018 by David. 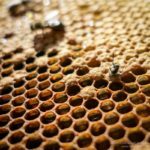 The importance of beekeepng records for the week to week management of colonies is undeniable, as discussed in the previous piece on this subject. However, they’re also useful when making comparisons over a longer time period. For example, I raised some queens a few years ago from a genetically distinct queen introduced to my stock. 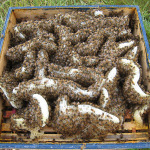 The bees were well tempered and good to work with. 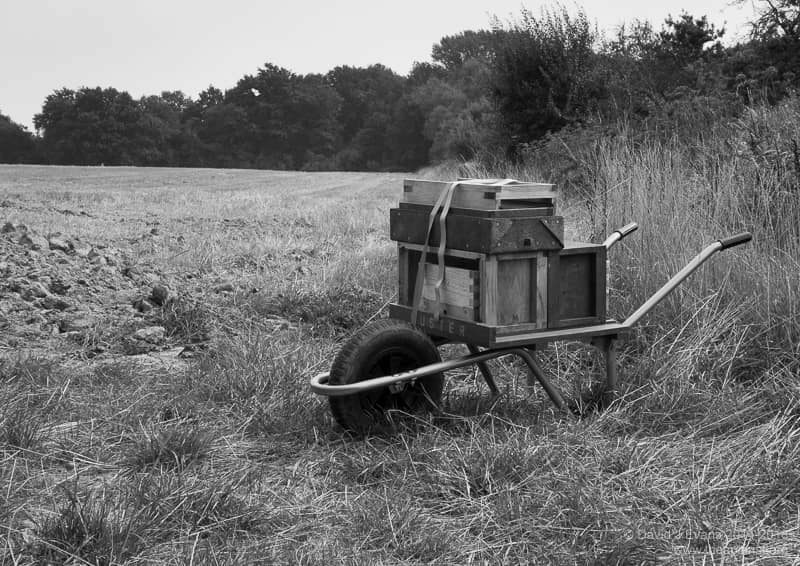 However, in comparisons over the following 12-24 months – where I had good records of the provenance of the queens – it was clear that this particular line struggled with chalk brood when the colonies were small or stressed. Almost all the daughter queens were like this … and in due course all were replaced. Similarly, if the notes you keep includes details of available forage – when the OSR went over, when the blackberry started or how well the himalayan balsam yielded – you can get an idea of what to expect in future years. How to keep the records and, to a lesser extent, where to keep them is the next problem. This is where I sometimes struggle. I’ve got the records, but not always in a readily useable format or location. I’m getting better and have a system that more-or-less works now, but it’s not foolproof. Data input. I know what I want to record, so don’t want to be ignoring superfluous (to me, perhaps not to others) fields when entering data. Therefore the interface to the database needs to be easily customisable. Although this is already possible with some applications it still leaves a problem with the input part of data input. 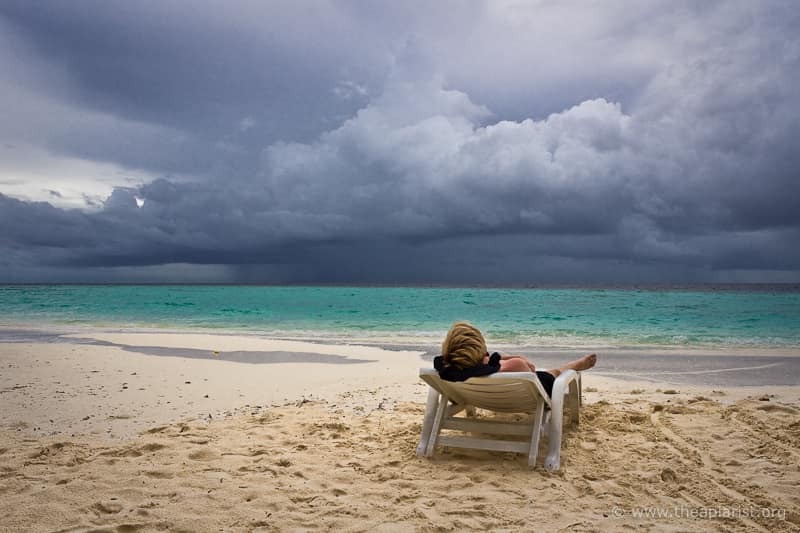 I don’t want to be tapping away at my mobile screen while surrounded by clouds of bees, or sticky with propolis. The combination of fat fingers, failing eyesight and bright sunshine (the norm in Fife 😉 ) gives me a headache when composing text messages … not an experience I want to replicate during a relaxing morning of beekeeping. Data backup and recovery. Where are the digital records stored and in what format? If they’re on the phone and I lose/change/break it I’m scuppered. If they’re on ‘the cloud’ (not that we have any of those in the Kingdom of Fife 🙂 ) then they’re nominally safe and accessible, until the application is no longer supported, or the apiary has no mobile signal. I use databases for work and have a reasonable knowledge of SQL but I still don’t want to have to manually extract sqlite records to recover old beekeeping notes. If BeeNotes™ goes belly-up after their KickStarter project fails to generate the $250,000 startup funding you’re scuppered … and if you have no idea what SQL, sqlite or KickStarter are then follow my example. 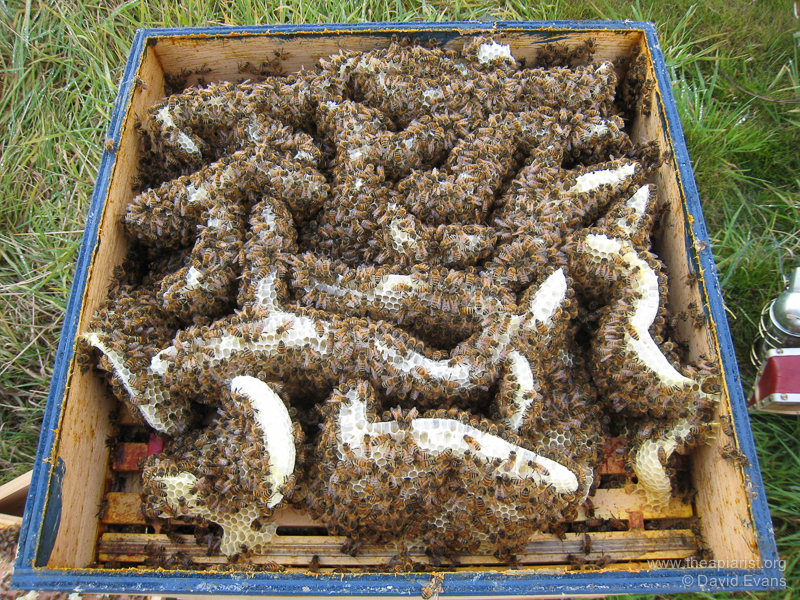 Hive records are generated in the field but are needed when you’re preparing to go to the apiary (i.e. at home … or wherever you keep your spare equipment) so you remember the super/dummy board/frame you made careful notes about last time. 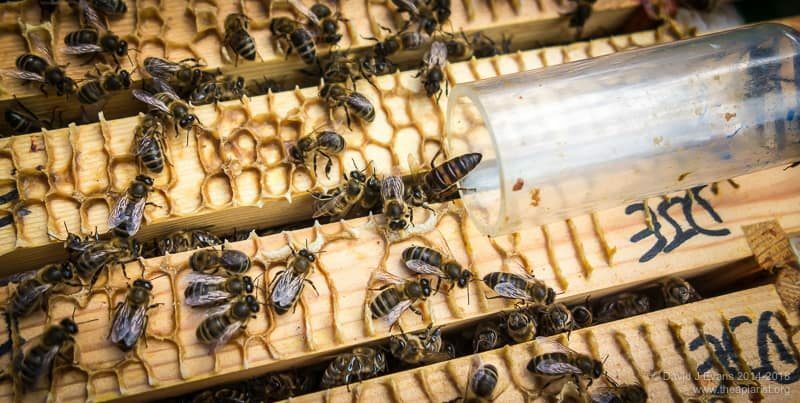 They’re also needed just before you open the hive, so you have an idea of what might be happening, what needs to be done or what to look out for – does the queen in this box need marking and clipping this time? Some beekeepers keep records tucked under the hive lid above the crown board. If you do this either use solid crownboards or keep them in a plastic envelope, or the bees might chew them. However, if stored under the hive roof they’re not available at home where your spare equipment is stored. 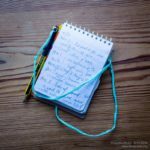 Others write notes on scrap paper as they inspect, transferring them to a permanent record once they get home (or – and I write here from extensive experience – forget to do this having filed them in the glove compartment of the car, or under a pile of papers in the kitchen). I’ve tried both approaches, but have ended up with a compromise solution that saves losing the scrappy notes before they’re deciphered and doesn’t necessitate writing things twice. 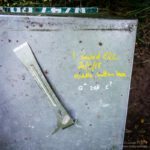 Some critical notes still get written directly into the hive roof using a queen marking pen; “QC sealed on Thur 17/5” for example. The black Correx roofs I make are particularly good for this. However, remember that roofs aren’t permanent fixtures … they can easily be swapped during inspections with potentially unintended consequences. I keep my written records on A4 sheets in a ring binder, with one sheet per colony. I can usually get a full year of inspections onto a single page. The table is headed with some brief instructions and boxes to record the apiary, hive number and queen provenence (if known). 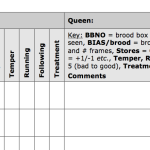 After that each row has space to record the date and the characteristics of the colony – queen status, brood, temper, steadiness on the comb, treatment and notes (see template). Rather than fill this in when I’m in the apiary – possibly struggling with propolis-covered gloves on a windy day for example – I use a small digital voice recorder to take the notes. After completing an inspection and closing the hive I just need to push the record button and make a quick comment … “Brunton apiary, hive 3, queenright, white, marked clipped, laying, 8 frames of BIAS, some chalkbrood, temper 4 but running a bit much, needs a QE and super next time”. 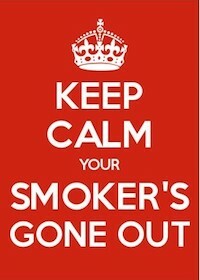 I usually do this having gently smoked the next colony entrance, leaving them time to settle before opening the hive. This process takes less time to record than to read and is saved in a folder on the machine with all the other inspection records of that day. Most mobile phones have a similar voice recording facility but I already have enough trouble seeing the screen in bright sunshine without inevitably adding a smear of propolis. 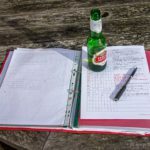 On returning from the apiary – probably after a full morning inspecting colonies in several apiaries – it’s an easy task to transcribe the notes onto the hive record sheets with a mug of tea for company. My digital recorder has a simple Play/Pause button, so I can whizz through the recording, one hive at a time, making the relevant jottings in the file. However, if I forget to (or don’t have time to) I still have the dated verbal records I can recall whenever needed … no scraps of paper to misplace or to get mangled when the beesuit goes through the wash. Then, before setting off for the apiary the following week I can quickly read through the last line or so of notes for each colony, making a mental note of what to be alert for and ensuring I have the relevant pieces of kit with me. 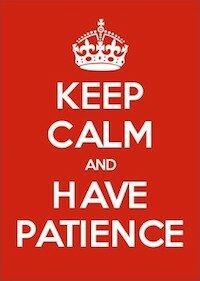 During peak season, when there’s a lot to remember (or forget! ), the hive records book goes in the car with me to the apiary. For the first couple of seasons I kept the recorder in a plastic bag to protect it from propolis. The Pause/Record button is big enough to use with gloves through a bag. However, the bag was ‘re-purposed’ to collect some blackberries or something like that and was never replaced. It’s now a bit tacky on a warm day but works perfectly well. A couple of AAA batteries lasts ages and newer models have a rechargeable lithium battery which would be even better. 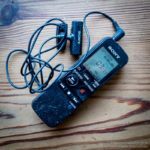 These small digital recorders have some fancy features which almost always include voice-activated recordings. These detect pauses in speech and stop recording. I’ve never had this work satisfactorily in the apiary and have given up trying. 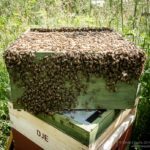 Usually the machine would never pause because of the ambient noise level – bees buzzing about, wind in the bushes – leaving 10 minute intervals of me inanely muttering as I pottered about the apiary or returned to the car to collect things I’d forgotten. Believe me, these don’t make entertaining listening … “Hmmm, hive tool? Where’s the damned hive tool? … was that a partridge calling? … mutter, mutter … seconds frames, poor investment … what an enormous slug … [extended period of bees buzzing frantically] … [out of tune singing]” and so on. 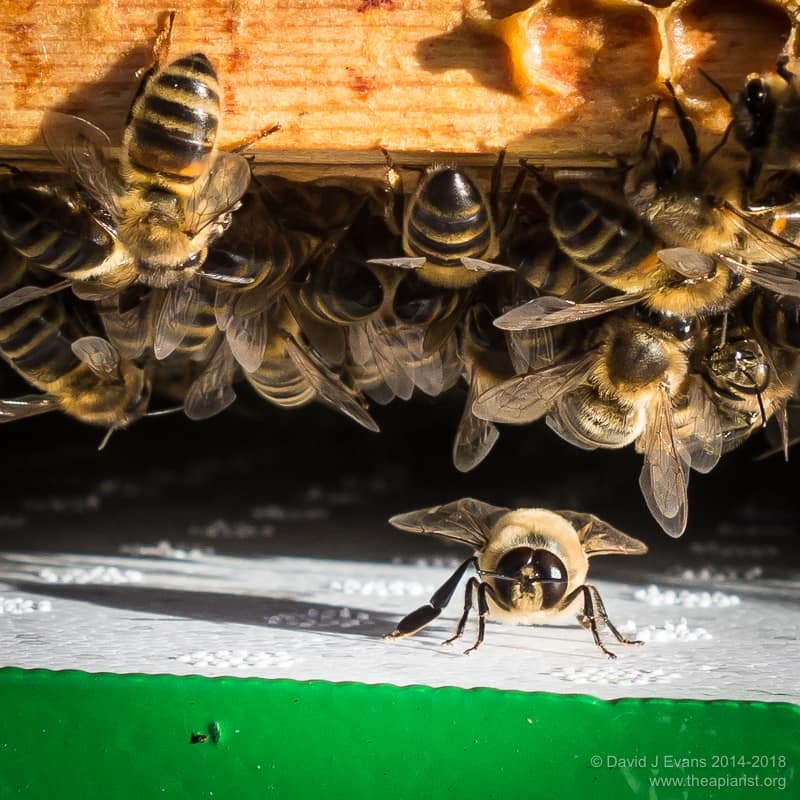 This entry was posted in Beekeeping, Records on October 9, 2015 by David.